Remembering Herby, my brother on what would have been his 68th birthday. There are only a certain amount of photos I have of my brother. He’s been gone since 1970. He was 22 years old when his helicopter was lost over South Vietnam. The helicopter was never found, although, thankfully, his remains were. A long process that took 37 years to identify. This particular photo could easily have been one of the last photos taken of him. I say this because, well, with limited amount of photos, this one has clues to it’s age. The Firebird patch is sewn on the green fatigue shirt which indicates he was a Firebird (call name for gunship pilots) at this time so that would have been during the later half of his tour of duty in Vietnam (1969). He looks a bit more mature than earlier photos of him in Vietnam. I think going to war would age anyone. The blue and white striped shirt that he’s wearing he also wore while on R&R in Hawaii, which was November 1969. I have photos of him in Hawaii wearing that same shirt. He looks happy and has that Herby Crosby smile on his face. I’m guessing this photo was most likely taken after his return from Hawaii. Why? He looks relaxed. He’s happy in love. He has that sly look of a man recently married (he married his girlfriend while on R&R in Hawaii, November 1969). I’m only guessing here, but I believe this photo was taken shortly before his death (January 1970). It most assuredly is one of the last photos taken of him. It’s one of my favorite because of his smile. I have limited photos of him because of his limited life. Yet, limited is hardly the word I’d use to describe his short time on this earth. He was blessed with good parents, a hardworking loving family, many friends, and adventures any kid would love to have growing up. Herby had plenty of rewards during his life, but he also endured accidents and illness that almost killed him in earlier years. He was no saint. He was the American kid growing up in the 50 and 60s. 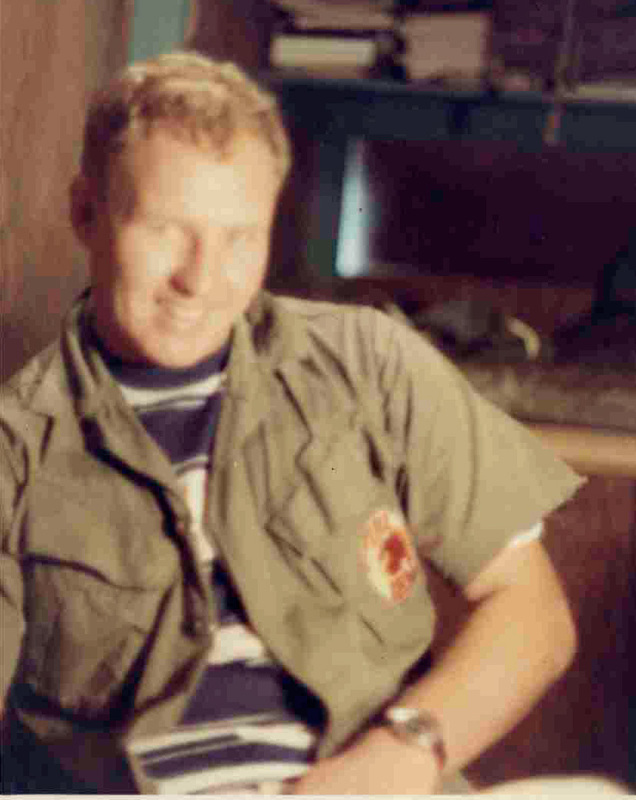 He followed his heart to serve God and country, beginning as a boy scout excelling to Eagle Scout, then from Army Private to Army Captain in one of the most feared helicopter gunship companies in Vietnam, the 71st Assault Helicopter Company at Chu Lai. I can only imagine how his life would have been had he survived Vietnam and returned home alive. He didn’t come home like I had hoped though, liked we all hoped. Yet, I thank the Divine Creator every day for bringing what remains were left of him home. I cherish the limited photos of my brother. I look at them often. Precious memories. Remembering Herby on this his birthday. Love that smile. This entry was posted in Capt. Crosby and tagged birthday, Capt. Crosby, Herby Crosby. Bookmark the permalink. your devotion to your brother is so remarkable I find myself still talking about you and Herby whenever the situation permits. Thank you Darline for your precious comments. I don’t remember you, but I am overwhelmed with nostalgia reading your description of his bedroom. I had all but forgotten the particulars until I read this. A flood of memories envelopes me now. There was a dark green afghan with a gold eagle embroidered on the center panel that was handmade by mom, that covered the bed too. I can still see his room. He was, and still is, my hero. We were one of the fortunate families, our loved one was repatriated, and identified. He returned home, just not the way we wanted, yet prayers were answered. Thank goodness for DNA. If you are ever in Arlington National Cemetery I’m sure he’d love a visit. His remains are in Section 60, plot 557. I visit as often I can. Miss him dearly. None of the Crosby family lives in Donalsonville anymore. Mom and Dad have passed on, buried there. We have a marker with them for Herby. And, one day I will be there also. Nina remarried in 1974, as her young life needed to move forward. Thank you for your support and caring through the years. Means so very much to our family.